Donald Trump’s national security adviser described his boss’s foreign policy approach as “disruptive” on the eve of the U.S. president’s first White House meeting with the Palestinian leader, saying his unconventional ways could create an opportunity to ultimately help stabilise the Middle East. Trump faces deep scepticism at home and abroad over his chances for a breakthrough with Palestinian President Mahmoud Abbas, not least because the new U.S. administration has yet to articulate a cohesive strategy for restarting long-stalled peace talks. 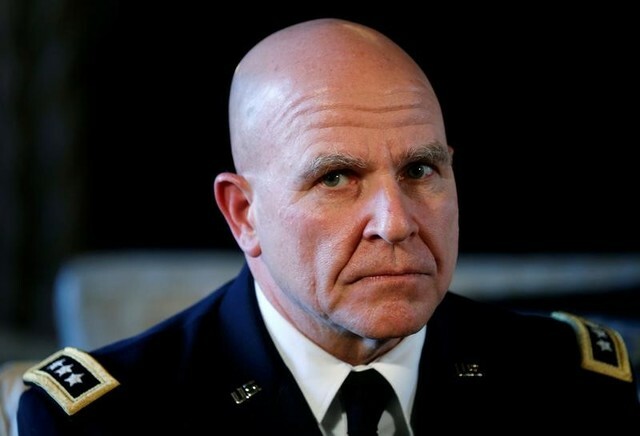 Seeming to brush aside such concerns, national security adviser H.R. McMaster told an Israel Independence Day celebration in Washington on Tuesday night that Trump “does not have time to debate over doctrine” and instead seeks to challenge failed policies of the past with a businessman’s results-oriented approach. Trump’s unpredictability has rattled friends and foes alike around the world. Some analysts doubt Trump can succeed where experienced Middle East hands failed for decades, especially when trust between Israelis and Palestinians is at a low point. Trump’s meeting with Abbas, the Western-backed head of the Palestinian Authority, will be another test of whether Trump, in office a little more than 100 days, is serious about pursuing what he has called the “ultimate deal” of Israeli-Palestinian peace that eluded his predecessors. Abbas’s White House talks on Wednesday follow a mid-February visit by Israeli Prime Minister Benjamin Netanyahu, who moved quickly to reset ties after a frequently combative relationship with Trump’s predecessor, President Barack Obama. Though expectations are low, plans are being firmed up for Trump to visit the right-wing Israeli leader in Jerusalem and possibly Abbas in the West Bank, possibly on May 22-23, according to people familiar with the matter. U.S. and Israeli officials have declined to confirm the visit. Questions have been raised about Trump’s choice of his son-in-law, Jared Kushner, who entered the White House with no government experience, to oversee Middle East peace efforts, along with Trump’s longtime business lawyer, Jason Greenblatt, as on-the-ground envoy. “President Trump has taken a typically unconventional and fresh approach to this problem,” McMaster said in a rare public speech. Having campaigned on an “America First” platform, Trump has acted forcefully against Syrian President Bashar al-Assad with no clear policy prescription and engaged in brinkmanship with North Korea over its nuclear and missile programs. The White House has been vague about what Trump hopes to accomplish with Abbas. U.S.-brokered peace talks collapsed in 2014. A White House official, speaking on condition of anonymity, said Trump would press the Palestinian leader to halt payments by the PLO to families of militants jailed by Israel and to stop anti-Israel incitement by Palestinian media. The administration seeks to enlist Israel’s Sunni Arab neighbours, who share Israeli concerns about Shi’ite Iran, to help rejuvenate Middle East peacemaking. Abbas, who governs in the West Bank while Hamas militants rule Gaza, is under pressure at home to avoid making major concessions to Trump, especially with an ongoing hunger strike by hundreds of Palestinian prisoners held by Israel. But Palestinian officials say it will be hard for Abbas to return to the negotiating table without a long-standing pre-condition of a freeze on Jewish settlement expansion on land Israel occupied in 1967 which Palestinians want for a state. Trump’s pro-Israel rhetoric during the 2016 election campaign raised concern among Palestinians about whether their leaders will get a fair hearing. He has also been unclear about whether he supports a two-state solution, a bedrock of U.S. policy for decades. Trump’s promise to move the U.S. Embassy to Jerusalem from Tel Aviv, strongly opposed by Palestinians, has been shifted to the back burner, and he has asked Netanyahu to put unspecified limits on settlement activity.